Known as "The Scion of the Flames, " Kyou Kusanagi is the heir of the Kusanagi family and destined to fight the Orochi. He can wield flames naturally. 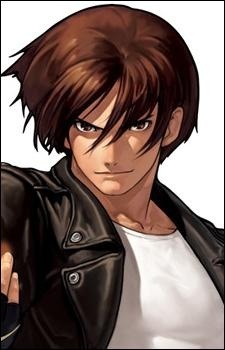 He won the national tournament and was entered in KOF. His team won the first three tournaments; however, in '97 he had to join with his rival Iori and Chizuru to fight Orochi as destined. After this, everyone was looking for Kyou and he hid in the US for a while. But he was eventually caught by NESTS, who used his DNA to create various "clones." Kyou eventually returned to the tournament and his friends. After Nests was defeated, Ash Crimson comes in hoping to steal the powers of the Three Sacred Treasure Team who are Kyou, Iori, and Chizuru; however two of Kyou's teammates have their powers stolen leaving Kyou the last remain.